This weekend's Clear Dollar Stamps color challenge over on PCP was hosted by Shawnee and she chose Bashful Blue, Silver and White. I kept wanting to go winter with these colors... but I decided to use one of my Scripture Verses from "Pretty Little Scriptures". 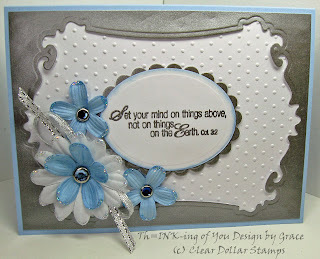 In case you can't read it... it says "Set your mind on things above, not on things on the Earth"
Stamps: Clear Dollar Stamps "Pretty Little Scriptures"
Paper: Bashful Blue SU!, Georgia Pacific White, Brushed Silver The Paper Co. Accessories: Spellbinder's Frameabilities Classic Frame, Nestabilities Small Classic Oval and Scalloped Oval, Cuttlebug and Swiss Dot Embossing Folder, Silver Ribbon (Nicole), Brads, ICE Stickles in silver, Unknown brads and flowers. The card base is Bashful Blue. I then cut a Brushed Silver Frame and used the Negative part, trimming to just fit inside of the BB Base. I cut a piece of GPW and embossed it in the bug with the swiss dot folder. I then stamped my image on GPW with VersaMarka and embossed in silver. I cut it out with an oval nestie, sponged with Bashful Blue ink from my SU! Marker, and matted with a silver scalloped nestie oval. I put the card together except to mount it all on the base. The sentiment is on dimensionals. I added the flowers and ribbon, punching the brad holes and inserting the brads before attaching the card front to the base. I had fun working with these colors... they are so sparkly and elegant, and even though I thought winter... I managed to make it non seasonal specific so I'm happy with that. My final touch was to add my new ICE Stickles in silver to the outter parts of the petals. I LOVE these new Stickles! Check them out at CDS (see banner on my right side bar). Thanks for taking a look and have a wonderful weekend. I am really babying a very very sore shoulder today. I actually am in a sling keeping it immobilized because it hurts so badly. So this was a one handed challenge... but when there's a will there's a way! LOL! What a really beautiful card, I don't know how you kept all of the layers straight one handed! Wow, what a pretty card. I just found out about CDS thru your blog,which I found thru Diane's. I love CDS's God-glorifying stamps. I'm also thrilled to find fellow sisters in the Lord in the paper crafting community. I'll be a regular visitor, for sure. Grace ! Take care of that shoulder ! LOVE this card ... the frame complements the center beautifully. And love that verse ! Hugs ! What an elegant card - those colors are fabulous. I like the sentiment as well - great job. Grace this is gorgeous, and the blue flowers just jump off of this card. Your frame is AMAZING! Hope your shoulder is better soon! Beautiful! Oh Grace this is just wonderful. I love the scripture you choose and the framing is fabulous. Oh my Grace this is stunning, love that frame and colors...your added flowers..so pretty!! This looks amazing! Beautiful card. I love everything about it. I love the colors and the scripture. Very pretty grace and a nice compliment to the scripture. TFS! So pretty! Love your Blog name too! Thanks for playing in my Blog Candy! Oh my Grace - even your one-handed creations are beautiful. I love the detail on this - the frame is stunning. Take care of your shoulder. that is one beautiful card! WOW is all I can say! Beautiful!! Love that brushed silver paper and the frame you created!! This is gorgeous, Grace...love all the layers and the blue flowers look sooo pretty!!! This is such a fabulous design....AWESOME work!! !